Hawker Restorations began as AJD Engineering, founded in 1987 by vintage aircraft enthusiast and electronics expert Tony Ditheridge, toolmaker Graham Self and carpenter Richard Watson, with the intention of restoring WWI fighters and high-performance racing and aerobatic aeroplanes. AJD’s first major contract was awarded by the Chilean government, which asked us to manufacture a 1914 Bristol M1C to celebrate the famous first flight over the Andes by Dagoberto Godoy in December 1918. The commission was quite a challenge, as we had less than four months in which to build the aircraft from scratch and fly it at an air show in Chile, but we succeeded and subsequently received further orders for a Bleriot, an Avro 504k and a Royal Aircraft Factory SE5a, typical of the aircraft flown in the early years of Chilean aviation. We went on to supply more than 20 more early aircraft types to museums around the world, including the iconic Sopwith Camel, the Sopwith Pup and the Spad 13. We also manufactured and restored a variety high-performance machines including the aerobatic Laser/Extra 200 and a Travel Air Type R ‘Mystery Ship’ originally raced by Pancho Barnes in 1928. Another high-profile commission involved rebuilding the famous 1937 Percival Mew Gull, G-AEXF, in which Alex Henshaw set the England to Cape Town record in 1939. 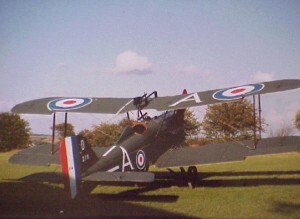 A further replica of G-AEXF in its 1939 configuration was then built from scratch, funded by Henshaw himself, and may now be seen in the RAF Museum at Hendon. 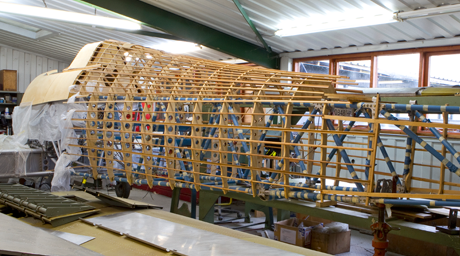 You may discover more about our early aircraft work on our Restoration Projects pages. During this period we also acquired the remains of two Hawker Hurricanes, and conducted a feasibility study into the possibility of restoring them to flying condition. 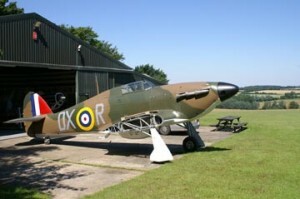 It was very soon clear that the Hurricane’s complex structure made it a much more difficult proposition than the monocoque Spitfire and other more conventional fighters, and that the costs involved in the remanufacture of raw materials, the creation of specialised tooling and roll forming were not affordable. The projects were consequently put on hold. In 1993 we supplied a WWI SE5a to world-renowned warbird collector Sir Tim Wallis in New Zealand. Having recently acquired a Hawker Hurricane P3717 from Russia with a view to restoring it and adding to his extensive fleet of WWII fighters, Sir Tim made enquiries with several engineers and offered the project to AJD Engineering, aware that we had already evaluated its feasibility. It was agreed that the restoration of three aircraft would make the job financially viable and we decided to proceed together as Hawker Restorations Ltd, with Sir Tim funding the raw materials, jigs, tools and document acquisition. Naturally the first of our restored Hurricanes went to Sir Tim in New Zealand. The second was purchased by Microsoft co-founder Paul Allen, and the third by Steven Grey of The Fighter Collection at Duxford. We have since built seven more, which are based in the UK, USA, Canada and France. Clearly, without the vision, enthusiasm and commitment of Sir Tim Wallis, there would be even fewer than 15 Hurricanes flying in the world today. Unfortunately, Tim suffered an accident in 1996 whilst flying a Griffon powered Spitfire MkXIV. This ended his flying career and Hawker Restorations was eventually taken over by Tony Ditheridge alone. 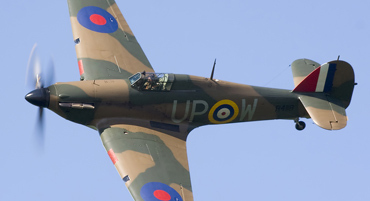 We have continued to develop our expertise, skills and tooling, and although the Hurricane remains central to our activities we have in the last few years rebuilt or been involved with a number other fighter aircraft including the Spitfire, Mustang, Corsair and Yak. Meanwhile the passion for WWI aircraft continues with the total restoration of an original 1917 SE5a. We are also building a perfect Avro 504k replica, complete with rotary engine. Our hangars currently hold three Hurricanes. One is a Battle of France survivor and the others are Battle of Britain fighters. One of these is being reconfigured as a two-seater, only the second ever built, in order that more enthusiasts may enjoy the extremely rare privilege of flying in the aircraft that saved Britain, and arguably the world, in the summer of 1940. Hawker Restorations has an ambitious expansion programme for the coming 18 months, with plans not only to expand our facilities with a CNC workshop but to relocate to larger airfield premises, enabling us to take on more projects in future.